You’re invited to enjoy the classic Southern city of New Orleans with The Arc as we network, learn and lead the movement for people with intellectual and developmental disabilities into the future! 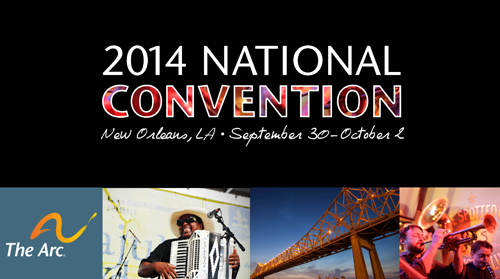 The Arc’s annual National Convention is set for September 30 – October 2 in New Orleans, LA with more than 600 people who share your passion for disability issues. Absorb the energy of committed volunteer leaders, chapter professionals, family members and advocates. And keep your skills fresh by learning from the best in the field and sharing experiences with colleagues from across the country. Add your voice to those who are shaping the future of The Arc. Then take that energy and enthusiasm back to your community and lead the way to change. For professionals: Sessions dedicated to your professional and volunteer leadership development. New ideas, inspiration and networking opportunities, plus National Conference of Executives (NCE) training and activities! For the grassroots: Sessions dedicated to advocacy and strengthening The Arc’s grassroots network, plus the hottest topics in the I/DD movement. For people with I/DD: A symposium planned by and for self-advocates plus educational sessions with opportunities to learn, grow and connect with each other. For everyone: Fun events and networking opportunities, a celebration with our local host, The Arc of Louisiana, plus shopping at microbusiness enterprises run by people with I/DD. Visit http://convention.thearc.org to register now to take advantage of early bird discounts, Chapter and Family Passes and special room rates at the Marriott in New Orleans, LA. Special Thanks to Our Sponsors: Comcast NBCUniversal, MetLife, Special Needs Alliance, DirectCourse, Hammer Travel, Mercer, Mutual of America, CARF International, Apostrophe Magazine, Wellpoint, Relias Learning and Insurance Benefits & Advisors.